Not only can plants reduce stress, but according to NASA, they also remove toxins to improve the quality of air. It’s therefore no wonder hotels, shopping malls and airports use shrubbery to improve the experience for customers, but to achieve their maximum benefit, they must look their best. Recently, London’s Heathrow airport installed a vertical garden of 1,680 airpurifying plants, including the Peace Lily and English Ivy, at Terminal 3, to please and relax passengers. For Heathrow’s travellers who use the installation to keep them calm amidst busy periods, it’s vital the garden is sustained and looking beautiful. The garden was installed by Biotecture, which provides living walls to transform any built environment. The Biotecture’s patented hybrid hydroponic system brings a new level of sustainability to vertical garden walls through intelligent water management, and stable system dynamics – all brought to life globally by the Internet of Things (IoT). Irrigation and regular maintenance are key to the long-term health of a garden wall. Biotecture therefore uses an automated irrigation control system to monitor flow-rate, which is a highly accurate measure of how an irrigation zone is performing. For example, if the rate fluctuates to higher than expected, it indicates a leak or pipe break. In the event of a failure (such as too much or too little water being delivered), Biotecture is alerted by email and text message. Historically, Biotecture had relied on standard data SIM cards to control the remote monitoring of its irrigation systems. However, with a single operator SIM it became difficult to distinguish whether connection had been lost, or to identify an issue with a controller on-site. Remote monitoring should provide secure knowledge of what is happening to the living walls. We’re dealing with living things so if an issue isn’t identified and dealt with, it becomes a big and costly problem. We therefore needed accurate foresight through robust remote monitoring. The only way to achieve this is through effective communication with our service provider, so we can categorically know whether a device is visible to a base station. The company therefore decided to move to IoT cellular connectivity provider Eseye to ensure continuous and direct communication between devices. Without that diagnostic capability we’re completely exposed on a live site, leaving us open to vulnerabilities, such as being unable to identify a leak. It could not only damage our reputation but also result in lost business. Biology needs proactive nurturing; prevention is critical, because if a problem is allowed to manifest it can be too late for a cure. Biotecture therefore needed a simplified communication device that offered foresight of an issue. The company implemented Eseye’s Pelican solution, which is designed specifically to interface with any standard utility meter. Features such as power fail alerts and accurate, consistent reporting provides Biotecture with peace of mind over the sustainability of its garden walls. The solution is also embedded with Eseye’s AnyNet Secure SIM to ensure complete confidence over network cover from the point of installation, no matter where in the world the unit is deployed. The Eseye technology was applied to Biotecture’s pulse sensor, which acts like a rain gauge. The Pelican sits inside the devices to record every pulse (or drop of runoff water) and feed directly into Biotecture’s monitoring, to guarantee the units are functioning as they should. We’ve dispatched units across the globe, from Dubai to Norway, so it’s vital that no matter where in the world we are working, connectivity will not let us down and our walls can thrive. 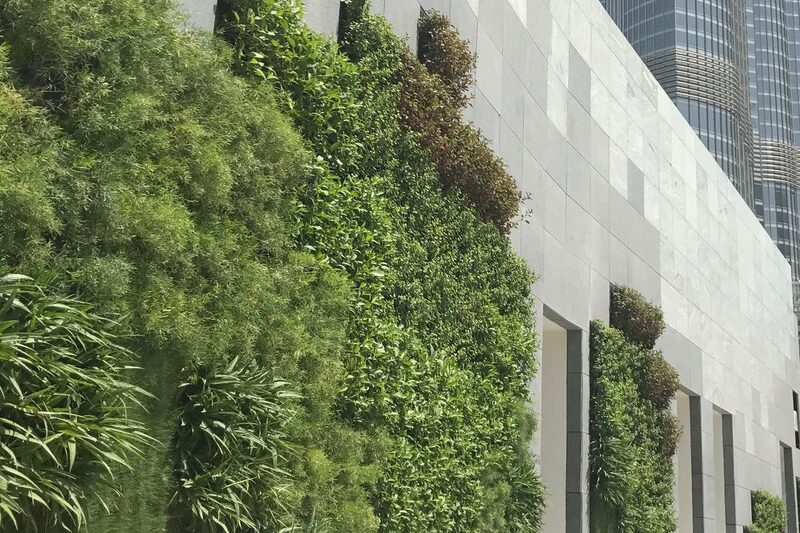 The assurance of the irrigation system’s connectivity ensures the health and longevity of Biotecture’s living walls, from London Heathrow Airport, to Trondheim in Norway to the Burj Island development in Dubai. The global roaming capabilities of Eseye’s AnyNet Secure SIM, combined with the seamless integration into the AWS Cloud platform mean we can troubleshoot issues that are typical when going onto a live site for the first time. For example, when we enter a project we have no knowledge of the network or signal strength. We therefore need the capacity to roam easily to guarantee connectivity.